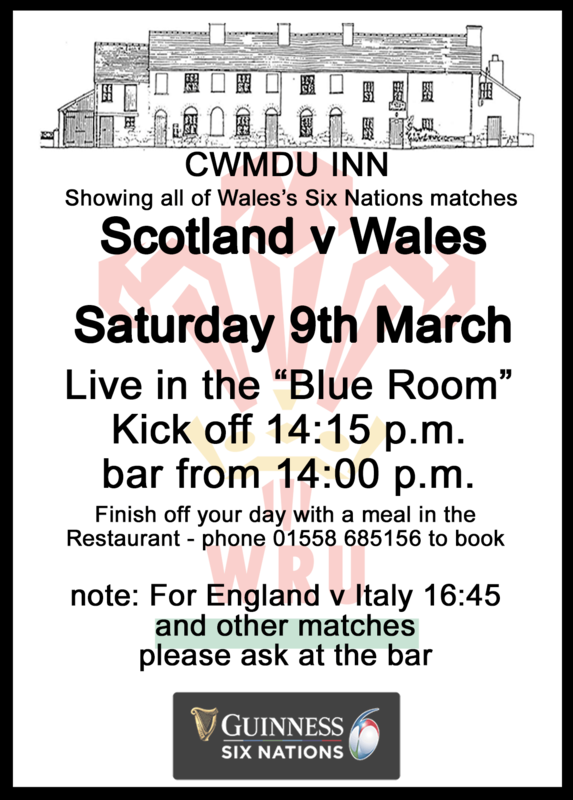 6 nations Rugby; Scotland v Wales, a match not to be missed. Will Wales maintain the winning streak and on track for the Grand Slam? Watch this in the comfort of the “Blue Room” at Cwmdu Inn, Cwmdu. Bar opens at 14:00 p.m., kick off at 14:15p.m. Stay on after the Scotland /Wales match to watch England v Italy – kick-off at 4:45 – Please call the bar if if interested in this match. Wales go into this, their 4th Six Nations 2019 match, with 3 wins behind them and on top of the table. The Dragons will be aiming to make it 13 matches without a loss and to keep their chance of the Grand Slam alive.